The city of Pittsburgh conjures up images of blast furnaces, steel mills, and rivers of molten metal. It comes as no surprise, then, that the venerable center of the steel industry in the United States is home to the latest champion of pure metal - Icarus Witch. Founded in 2004 by bass player Jason "Sin" Myers, the band includes such veteran musicians as guitarist Steve Pollick and drummer J.C. Dwyer (Pro-Pain, Soulbent, Paingod). Roses on White Lace is the debut EP from the band, and though originally intended to be a self-released demo it gained enough attention to be released by Magick Records. Icarus Witch proudly adhere to the huge metal sound of bands like Iced Earth, Judas Priest, Iron Maiden, Queensrÿche, etc., which is clearly evident on their freshman album. The title track, which is of course an Alice Cooper cover, leaves no question that these guys know exactly what direction they want their music to take. 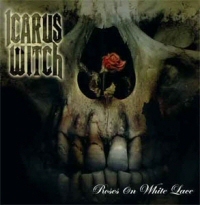 "Roses on White Lace" is one of my favorite songs from Alice's late-'80s metal phase, and I have to say that Icarus Witch have done an admirable job with it. Frontman Matthew Bizilia doesn't quite capture the sinister tones that Alice is so famous for, but his voice is nonetheless perfectly suited to this style of metal. The three remaining songs ("Halcyon" is actually a short ambient piece that would be better off as an intro) are Icarus Witch originals, and serve as stellar examples of the band members at their best. Fantastical/mythological lyrics accompanied by monstrous riffs, searing solos, and crashing beats fill each track, with "Dragon Ryder" establishing itself as my favorite. The twin-guitar opening riff is sensational, instantly drawing you in to the world of fantasy illustrated through Matthew's words. Sounding just a touch like Geoff Tate (Queensrÿche), but with a distinctive sound all his own, Matthew fits the mold of a pure metal vocalist. His voice soars and dives with emotion, displaying remarkable range, while blending perfectly with the mood of the music. "Curse of the Ice Maiden" and "Winds of Atlantis" also stand tall for their majestic riffs, distinctive bass lines, and intricate beats. Steve Pollick has established himself in the guitar world with three solo albums, and his skill and experience are evident in his tightly delivered leads and deep, crunchy riffs. Steve creates quite an Iced Earth feel to the songs, but only as a reference point and not an imitation. Sadly, Roses on White Lace clocks in at only 17 minutes and thus leaves the listener somewhat unfulfilled. Thankfully the band is on the verge of releasing a full-length album on Magick Records. Fans who love the driving, true metal sound of the '80s combined with today's robust production will absolutely love what Icarus Witch have to offer. Highly recommended.